Many people, when they hear the word “engineer”, often think about a really difficult, yet highly rewarding job. There are various different types of engineers in the world, and they all have their own specific job perks and benefits. 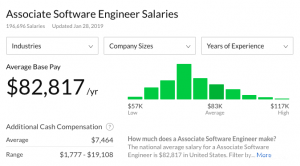 As of late, however, there has been a lot of buzz around software engineers, especially when it comes to the average software engineer salary. People claim that this profession can yield a pretty hefty salary! 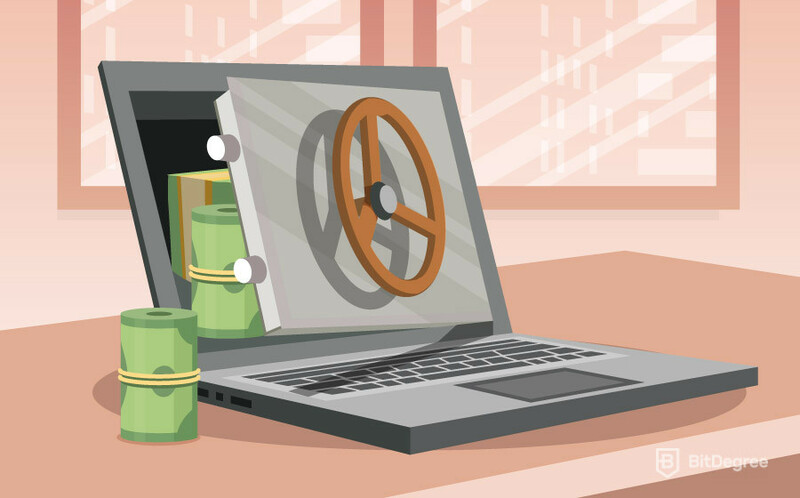 If you’re thinking about becoming a software engineer, or you simply want to find out the software engineer starting salary – you’ve come to the right article! At the very beginning, I’ll tell you briefly about software engineering, in general. Probably one of the most common questions that people have when it comes to this specialization is “is software engineering the same as software development?” – and that is what I’ll tell you. After that’s done, we’ll talk about some of the main groups of software engineers out there. And then, finally, we’ll be able to move on to the actual software engineer salary. It’s important that we talk briefly about what is software engineering mainly because you will then be able to get a better idea of what this job involves. Furthermore, as I’ve mentioned in the beginning, it’s important that we’d clear out any and all misconceptions about software engineering being the same thing as software development! Even though many people confuse the two professions, they are actually fundamentally different. A good way of differentiating between them is understanding that a software engineer could become involved in software development if he or she’d want to. However, software developers basically couldn’t deal with software engineering. The main difference is pretty simple – while software developers work with the software itself (the program, its features, visual side, etc. ), software engineers are concerned with the very fundamental level of creating the actual software (the platform on which the program will be built by the developers). Other than that main differentiator, the variables of the two jobs are also quite different. Naturally, things like working conditions, skill requirements and everything in between are going to be quite distinct for the two professions, but the average software engineer salary is also going to be quite different from that of a software developer. With that said, you can probably now see and understand the main differences between the two lines of work. However, before we actually move on to talking about the software engineering salary, we must first discuss the different types of engineers that there are. Generally speaking, there are three types of job classifications that a software engineer could fall into – entry-level, junior (associate) and senior. Even though the “associate” title may be somewhat unique to the engineering specialty, you will find that most jobs in the world use sub-titles like “beginner” or “senior” insert job title here. But why do you need them? And what difference do they make, if any? First of all, different tags associated with a job title carry a different meaning. Before anything else, they help to identify the skill level of the person in question. Just to make things more simple, let’s use the job title of a photographer as an example. If you’ve never dealt with photography professionally, but want to get into it and start learning all of the tropes, you’d be called an entry-level photographer. After you’ve gained some experience and know-how, you might advance to the junior level. Finally, if you decide to dedicate your life to the art and live, sleep and breathe photography – you’d probably reach the senior photographer’s rank. Does that make sense? Different tags aren’t only used for verbal clearance, however. The very first thing that you’ll notice is the difference in the software engineer salary – it would only make sense that people with varying skill levels receive varying salaries, don’t you think? This is one of the main reasons as to why it’s really difficult to give a straight and simple answer when asked – what is the average software engineer salary? Furthermore, different tags also grant various perks and benefits associated exclusively with them. So, with all of that said, let’s take a look at the different types of software engineers that there are. 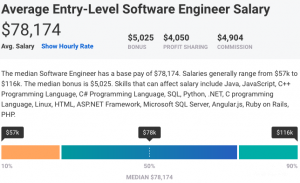 The entry-level software engineer salary is something that people rarely talk about, unless they really want to know the software engineer starting salary. The reason why I say that people rarely talk about it is because it isn’t all that spectacular, at least when compared to the associate or senior ones. However, beginner software engineers also usually don’t really do the same amount (and quality!) of work as their colleagues! Entry-level software engineers are mostly people who have just graduated (or not yet even) university and are now looking for their very first stable job. They have no experience in the field – none. Also, these people are usually still unsure whether or not this is what they want to do for a living. There are a lot of wannabe software engineers who quit their jobs only a few weeks in and never looked back – it’s a difficult profession! This is especially true if these people didn’t really pay all that much attention to their studies. These (and a few more) reasons help to explain the lower entry-level software engineer salary. However, if you’ve ever worked a day job, you probably know these things perfectly well yourself – every single workplace expects you to prove your motivations, passions, and everything in between with hard work. The associate software engineer tag is probably the most common one that you’ll encounter. This is because it is honestly the biggest group of the three – both entry-level and senior software engineer groups overlap with the associate one. An associate software engineer is someone who has already had some experience with certain engineering projects, and can already understand some of the intricacies around the job position. Same as the entry-level students, these junior level engineers are often tasked with some of the more learning-based tasks within the company. However, the main difference is that associates get to often work on some of the more difficult projects, as well. In addition to that, the associate (junior) software engineers are often tested to assess their skill level and growth. If they work hard and try to learn new things every single day, chances are that they will do great within the job, and will advance through ranks in no time. The associate software engineering salary is a bit complicated when compared to the other two groups on this list. I will go a bit more in-depth for why that’s the case later on in the article, but let’s just say that the group being extremely broad has a thing or two to do with it. The last type on this list, the senior software engineers are some of the most respected and seasoned veterans of the industry. Senior engineers, as the title probably implies, have dedicated their lives to learning, researching and perfecting their skills in the field of software engineering. These people usually have very different tasks when compared to the beginner or junior groups of engineers. Senior members of the team work on huge and complicated projects, are the leaders in maintaining and preserving them, and might even be tasked to become mentors to the less experienced engineers of the team. 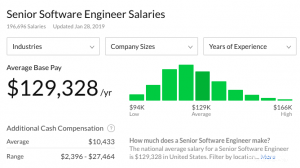 Whenever there’s a discussion going around about the senior software engineer salary, the numbers that are thrown out there are always somewhat insane. That being said, people often tend to forget just how much time and work these engineers have put into their craft. Having multiple important responsibilities and working on a few big projects at a time are no easy feats – it would only make sense that the senior software engineer salary would represent that. Now that we have the definitions and types of engineers sorted out, we can finally move on to talking about the actual salaries that these people make. Keep in mind that all of the numbers presented below are just estimates, and are by no means guarantees that you’ll make an X amount of money working in that specific skill group of software engineering. Furthermore, I’ll be referencing the average monthly salary in the US, just for comparison’s sake. As of writing this article, the salary sways at around the $3700 USD mark. Students don’t usually expect to make a lot of money out of their entry-level software engineer salary. However, depending on the company that you decide to work in (and that hires you), the numbers might actually not be all that bad. PayScale.com estimates that the average annual software engineer starting salary should be around $78,000 USD, or $6500 USD per month. Now, I know what you’re thinking. This is almost double the average salary in the US – what in the world am I talking about when I say that it’s not impressive?! Well, let me explain. Before deciding whether or not this number is impressive, one must take into consideration the fact that software engineering is an extremely difficult skill set to master. It takes many years for a person to become proficient with software engineering. In turn, since the profession requires so much time and attention spent learning and mastering it, it would be fair to expect a bigger-then-average salary. As I’ve hinted at a bit earlier in the article, associate software engineers are difficult to generalize when it comes to their salaries. Since the junior (associate) group is so large and there’s so much overlap, the number may always fluctuate and change, depending on some specific circumstance. With that said, however, Glassdoor.com still provides an estimate of the junior software engineering salary. According to the site, associate software engineers can expect to make almost $83,000 USD per year, or almost $7000 USD per month. You can see that there isn’t a big jump in numbers when compared to the entry salary. There are a few reasons for why that might be the case, however, the main one is still probably the above-mentioned overlap. Either that, or the companies that hire junior software engineers simply aren’t ready to pay a higher salary until the engineers actually prove their skills and dedication to the team. Finally, we have reached the topic that most people reference when they talk about making a lot of money as a software engineer – the senior software engineer salary. Without any further ado, let’s take a look at what GlassDoor estimates could be the salary of this group of engineers. If you were to believe the data on the site, senior software engineers should make almost $130,000 USD per year. That’s more than $10,800 USD per month! Now, seeing this number, it becomes pretty obvious why people reference senior software engineer salaries as the salary goal that everyone should strive for! However, let me stress this one last time – it’s easy to look at the numbers and be amazed. But we must understand how much hard work goes into achieving the status of a senior software engineer! If you were to dedicate your entire life to a single, specific area, it would only make sense that you’d expect to be compensated accordingly! Well, this is it – now you have a pretty good understanding and idea of just what different types of software engineers can expect to make as a software engineer salary. Whether you’re planning to follow the path of software engineering yourself, or you simply clicked on this article out of sheer curiosity – I hope you found what you were looking for! If you do, however, decide that becoming a senior software engineer is the goal of your life – go for it! Evidently, it’s really hard work, but as you’ve probably noticed, the pay is worth the hustle! Good luck, and I wish you the best of luck going for that software engineer salary! 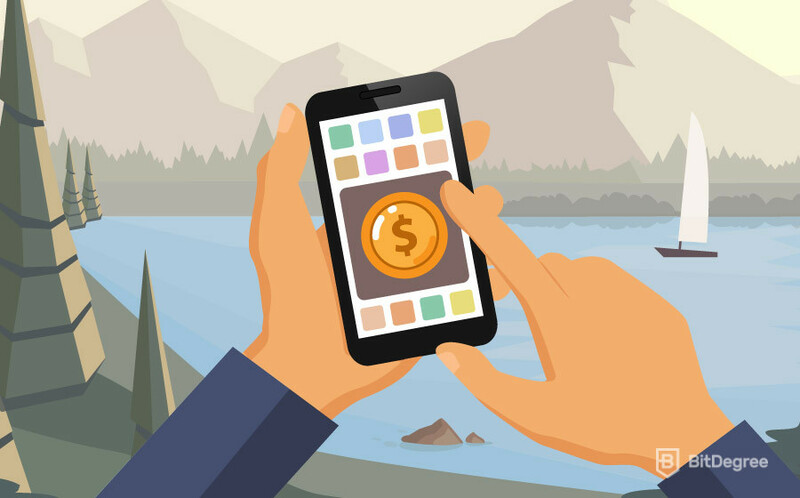 Game Developer Salary: How Much Do They Make? Data Analyst Salary – Facts or Fiction?